Operation principle: when the signal from the detector is received, the corresponding LED lights up. The device has different vibration modes to indicate the signals received from several detectors. When the signal is received from two detectors at the same time, one LED lights up changing its color from red to green. 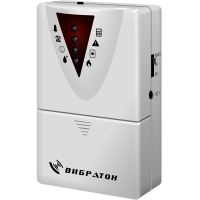 RESET button is used to stop indication after detector’s actuation and switch the detector to standby mode. 1. Unpack the portable receiver. 2. Remove the wall mount from the clip. 3. Open the battery door on the front panel. 4. Insert the batteries (size LR03) ensuring the correct polarity or connect the device to the external power supply ( 9V, 100mА). 5. Close the battery door. 6. Set the ID code corresponding to the base unit (if necessary). 7. Attach the wall mount on the wall using self-tapping screws. 8. Mount the portable receiver on the wall mount or fix it on a piece of clothing using the clip. 9. Switch on the portable receiver, set the required mode using the switch at the side panel. 10. Press RESET button to reset the device. 1. Open the battery door on the front panel. 2. Remove two central screws at the rear side. 4. Set the ID code corresponding to the base unit using microswitches. The default setting: all microswitches are in ON position. All paired devices must have the same ID code. 5. Attach the front panel. 7. Close the battery door. 1. Connect the induction loop to the jack at the top of the detector. 2. Put the induction loop around your neck. 3. Switch the hearing aid to T-mode. The induction loop can be connected to the portable receiver for the alert signals from detectors to be transmitted directly to the user’s hearing aid. Signals are transmitted in accordance with Table 1.